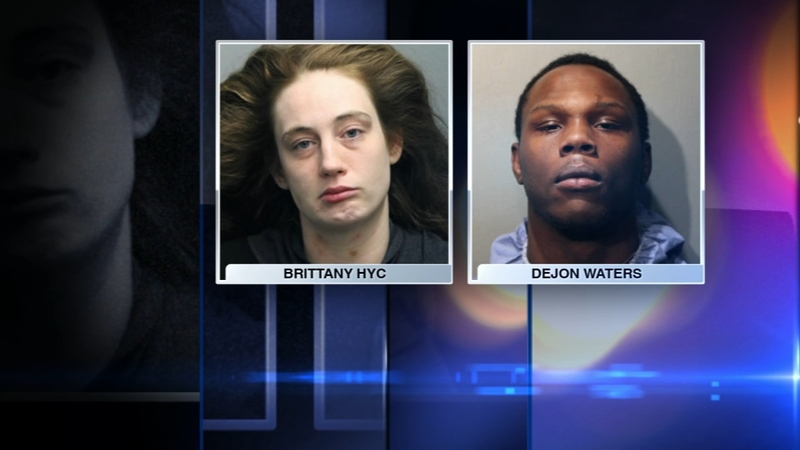 CHICAGO (WLS) -- A mother and her boyfriend have been charged in connection with the death of the woman's 2-year-old son in Washington Park, Chicago police said Thursday. Police responded to the 6000-block of South Prairie Avenue at about 6:50 p.m. on Monday and found the boy unresponsive and with visible injuries to his face and body, police said. Gibbons' mother, 28-year-old Brittany Hyc, was charged with child endangerment and her boyfriend, 21-year-old Dejon Waters, was charged with first degree murder. Police said Waters was in charge of babysitting the boy and admitted to physically abusing him, causing the fatal injuries. Police said Waters had battered the child on previous occasions, and Hyc knowingly endangered her child by leaving him in his care. "Defandant Hyc went on to say she still left the victim with defendant Waters because she had to go to work," Assistant State's Attorney James Murphy said. Prosecutors say when Hyc returned to her Washington Park home after work Monday, she found Ja'hir unresponsive on the floor. They said after trying to revive the child for 20 to 30 minutes, she went to get help from neighbors while her boyfriend went to get cigarettes. "She came knocking on my door saying, 'Can you please help me? My baby is not breathing.' So I threw something on. I ran next door, grabbed the baby. The baby was cold as ice," a neighbor told ABC7. Prosecutors said Hyc had noticed bruises on her son a week or two before he was killed. Days before Ja'hir died, investigators said there were searches on his mother's iPad for how to hide bruises. The Illinois Department of Child and Family Services had contact with the family in August, October and most recently, last Saturday. Ja'hir's 5-year-old brother was also taken from the home after police said he was covered in bruises. The boy's father, Robert Gibbons, said he believes there were warning signs of abuse that were ignored. "My son Ja'hir was very a playful, very loving son," Gibbons said. "It was hard to say that was my son... that is how bad he looked at the autopsy." But Gibbons said he endured months of abuse. Gibbons also puts blame on the Department of Child and Family Services. The father of two said he called DCFS several times in the past and wanted his children removed from that house. He said DCFS failed his son. Ja'hir died less than 48-hours after an agency contracted by DCFS visited the home and reported that the children were safe. DCFS released a statement saying that as part of initial review of Ja'hir's casse, "DCFS learned that two separate and contradictory reports were submitted regarding this home visit" and have ordered an investigation into the caseworker responsible for it. "During the investigation, the worker will not be permitted to have any contact with children or families. Falsifying records will not be tolerated, and DCFS will pursue all available discipline, including termination, if records were falsified," the statement from Interim Director Debra Dyer-Webster said. DCFS said they found two reports submitted in the case; one from the morning of March 17 that said both children were in the home on March 16 at 12:30 p.m., and the second from the morning of March 19, that said only one child, Josiah, was home on March 16 at 12:45 p.m.
DCFS said the caseworker was employed by a private agency called Omni. Ja'hir will be laid to rest at the Westgate Funeral Home, 616 Washington St., Waukegan, on Saturday. Family members are trying to figure out how to pay for the services for a 2-year-old boy they did not think they would be saying goodbye to. Hyc was not in court Thursday afternoon as she is being treated at an area hospital. Both are due back in court next Wednesday.